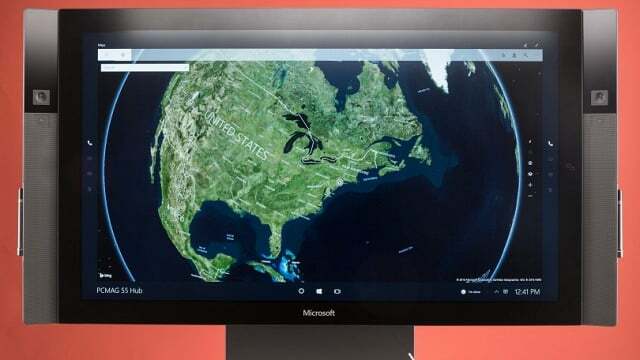 The Microsoft Surface Hub is a revolutionary device that combines a virtual whiteboard, videoconferencing, and Microsoft’s Windows 10 Universal App ecosystem. You can scribble ideas on an endless canvas, chat with coworkers across the pond, and create a Microsoft PowerPoint presentation—and you can do them all at the same time. But that’s just scratching the surface (sorry, I had to) of this device’s capabilities. If you’re interested in product specifications, performance, or setup, you should definitely read our in-depth review, which I linked to at the top of this piece. If you’re more interested in how this device will forever alter your meetings and your concept of teamwork and collaboration, continue reading this article. It’s not unusual for a screen to be able to accept display input from a laptop or tablet. Any smart TV or computer monitor can do that. However, with the Surface Hub, you can beam your laptop’s display onto the Surface Hub’s 55- or 84-inch screen, where the meeting’s lead will be able to copy the screen into the whiteboard to take notes with the Surface Hub’s pen and finger inputs. This is a huge time-saver. Rather than having documents shared via Microsoft OneDrive or passed from one person to the other via email, everyone on your team can analyze the document on the Surface Hub’s screen or in their Microsoft Skype for Business window, and changes can be made in one session with the entire group. Your Surface Hub screen can be segmented into three smaller screens. You can, for example, open the whiteboard app alongside your Microsoft Edge browser, and then open up Skype for Business. The whiteboard and Edge browser can be expanded and shrunk as much as you’d like, but the Skype for Business screen will sit along the left- or right-hand rail, taking up about a fifth of the screen. The beautiful thing about the whiteboard app is that it provides you with an endless canvas. With a physical whiteboard, you typically spitball a few ideas and then take a photo of the whiteboard to save the ideas for posterity (before erasing the whiteboard to create room for more ideas). With the Surface Hub, you can spitball into infinity without losing any of the data you’ve created. You can drag images into the whiteboard, zoom into specific text or images that might be too small, and drag and drop images and text from their original locations to a more convenient location on the whiteboard. Think of it in this way: You could have up to 100 fingers writing words on the Surface Hub’s screen. At the end of your meeting, you can create a “Good Idea” and a “Bad Idea” column and you can drag all of the ideas to their appropriate column. Just don’t forget to email the whiteboard to yourself before the meeting is over because the Surface Hub automatically wipes its drive after every meeting. Typical presentations are boring. Someone stands at the front of the room and uses his or her finger or (God forbid) a red laser pointer to point at data. With the Surface Hub, PowerPoint becomes a physical part of the presentation. You can digitally ink any talking points on which you need to focus. If someone can’t see something to which you’re referring, you can zoom in and enlarge the image. You can swipe back and forth from slide to slide without using one of those awful wireless mice and, if you need to go off-topic, you can just open up the whiteboard and start taking notes alongside the presentation. You could also have one of your presenters practice his or her presentation on the left-hand side of the Surface Hub while you and a colleague takes notes critiquing the presentation in the whiteboard, which is occupies the right-hand side of the device. Download the TechSmith Loop app for the Surface Hub and pretend you’re a sports broadcaster on a telestrator. You can start, slow, stop, and analyze video frame by frame with the app. Best of all, you can annotate and record directly onto the video file so that the next viewer sees what you wrote. For example: If your video team has edited a product video, you can go in and create notes for specific instances within the video. Was there a sloppy cut? Write “sloppy cut” at the exact moment the cut occurs. Did they leave in a product that they were supposed to remove? Circle the product and draw an X over it. And, like any other Surface Hub app, you can do this all while explaining yourself to someone over Skype. If the Windows ecosystem doesn’t have an app that can help you improve your workflow, Microsoft lets you build your own app specifically for the Surface Hub or the Windows 10 Universal App ecosystem. Siemens Product Lifecycle Management (Siemens PLM) created the JT2Go app, which lets users navigate assembly structures found in engineering and architectural models. Picture something like a carburetor: The app lets you take a 360-degree view of the engine by spinning and rotating the image. You can enlarge, shrink, or highlight specific parts within the carburetor, click into specific parts for additional detail, add detail to the image, make notes, and adjust the image as needed. Siemens PLM created this app for this specific use case but there’s no reason you couldn’t replace the word “carburetor” with “shoe,” “building,” or “bridge” to achieve a similar effect. These five examples are by no means the extent of what you can accomplish on the Surface Hub. These are just the five most obvious and valuable use cases. If your team relies on group meetings and collaboration to get work done, I suggest getting a Surface Hub demo to find out if it’s capable of changing the way you work in additional ways.